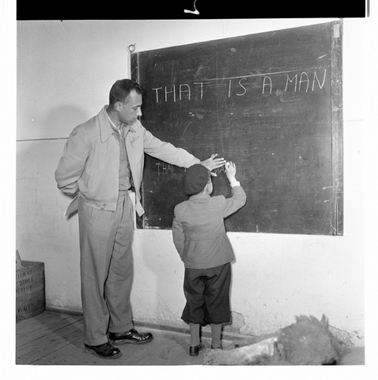 JDC - Archives : A pupil at the chalkboard with his English instructor in the Hallein DP Camp. Title A pupil at the chalkboard with his English instructor in the Hallein DP Camp. Description Scene in an English language class for children of DPs. Started by the JDC in January 1953, and using books provided by the US Information Center, the program's 'student body' has grown to 150 pupils enrolled in 12 courses here in Camp Hallein, in Camp Asten, Camp Rothschild, Vienna and in Salzburg. The instructor comes from the local evening school.